On the surface, these three items fit well together. Lawyers write contracts and need phone service. Phone service providers have contracts. Well, only two of these things need to belong together...lawyers and phone service! Many hosted VoIP phone providers are re-writing the rules in the communications industry and not requiring their customers to sign term contracts! In taking such a position, these hosted VoIP providers are displaying tremendous confidence in their service delivery and billing practices. "When we started the business ten years ago, we knew just how frustrated business owners were with being held to term contracts for their telecommunication services," indicates Robert Conner, CEO of sipVine, Inc. "We wanted to take a dramatically different position in how we approach customer service and contracts. 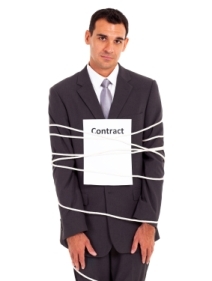 By not requiring term contracts, we are seen as more of an extension of a business rather than a provider. Thus, our customer churn rate is negligible." An Enterprise-level System at a Low Capital Investment - Many attorneys starting their own firm or managing their own firm have worked for a large practice before and have experience with the value of an enterprise-grade phone system. Where a hosted product can deliver similar features, it comes at a capital price tag of a fraction of an on-site phone system. Because the actual phone system exists in the "cloud" (really the data center of the hosted VoIP provider), all the law firm needs to purchase are the VoIP phones and some other minor equipment. VoIP handset manufacturers differ in price and quality, but it is easy to secure high quality VoIP handsets from a top tier manufacturer (such as Cisco and Polycom) between $100 and $200. Thus, the price of their "system" is minor in comparison to on-site systems. Features that will Enhance their Communications - The features available with a hosted VoIP phone system are vast and have broad appeal. 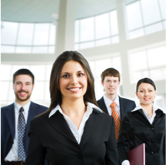 Attorneys utilize many, but several drive specific benefits to the firm. Examples include call detail records to aid billing efforts, call recordings to assist documentation, voicemail to email to relay important messages while the attorney is away from the office, and automated attendants to best route callers to the right individual. Custom Settings - Call flow design can direct callers to paralegal or other support as a screening step before an attorney is engaged. Good hosted VoIP providers can custom build a call routing routine that matches exactly the desires of the firm and which will better serve their customer base. Expert Administration - Law firms are in the business to serve clients, not to spend resources on administering their phone system. Good hosted phone companies provide administrative services for their clients, leaving law firms to practice law. Even self-service portals can take time away from the practice, so a telephone "concierge" service is very well received by firms of all sizes. "Although sipVine serves many businesses from all market segments, one of our most highly represented vertical markets is the legal profession," continues Conner. "Certainly, the features and benefits are a big driver, but how we support them has created a very loyal base. They also network with each other well, and we're always receiving new clients based upon a recommendation from one of our law firm customers." If you are a law firm, or a business who is compelled by similar features and benefits, a hosted VoIP system is a perfect fit. When looking at the customer demographics of Hosted VoIP buyers, professional service firms represent the largest category. Marketing and Advertising firms are included in this category and are moving their phone services to Hosted VoIP at a rapid rate. A recent report published by Software Advice suggests that 33% of small businesses business buyers are in the Professional Services category. At sipVine, a Hosted VoIP company based in Kansas City, we examined our customer profile and determined that 20% of our customers fall into this category, as we have a stronger percentage than normal in the finance, insurance, and real estate industry. 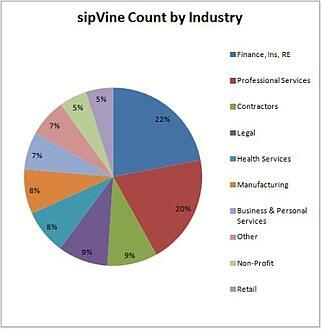 Within the professional services category for sipVine, 20% are made up of Marketing and Advertising type businesses. Traditional advertising agencies, web design, and marketing consulting firms dominate the customer profile, but we're also seeing many new entrants in this category. Start-up firms specializing in digital marketing and social media are in need of a low investment, scalable solution for their business phone needs. As with most businesses, the advanced features offered by a hosted system are very attractive to firms in this market segment. Many employees of these firms are very mobile, working with their customers on location or moving from meeting to meeting. Having features such as voicemail to email, find me follow me, or soft phone applications, allow them to be reachable and very responsive with their client base. Further, these businesses do not need to invest in an expensive, on-site phone system to receive the benefit of these features. One of the great benefits of a hosted platform is that the up-front investment is very affordable. You are not paying for the system, installation, or the on-site resources to administer it. Businesses only need to pay for the VoIP phones utilized. Another common feature valued by marketing & advertising firms is three way conferencing. A account executive can conference a customer and an internal resource with a few strokes on the VoIP Phone. Conference bridge services offered by many hosted providers can pull together large meetings of remote employees or customer contacts. Finally, with a hosted service, employees or contracted resources can be on the company phone system wherever they are deployed! We have seen where marketing firms hire resources where the expertise exists or deploy them where they can be most effective. Thus, employees or contractors deployed on a customer premise, out of town, or simply working from home can all be provided VoIP phones or soft phone applications that provide the appearance that they are all working under the same roof! They can be provided direct dial numbers and internal extensions and calls can flow to them. We've discussed several of the great features or attributes that make Hosted VoIP services right for these agencies and firms. However, one thing that is apparent to us at sipVine is that most businesses operate differently and have divergent priorities when it comes to their internal and external communications. The power in Hosted VoIP is that it is essentially a program, one administered by professionals. Thus, Hosted VoIP providers are in a great position to listen to the needs, priorities, and unique characteristics and build the call flow, auto attendant, and phone set-up to match. Take time to find a provider who will do just that for your agency or firm. Hosted VoIP, custom built and deployed for responsiveness, should provide the communications platform that will arm your agency with another point of differentiation in a very competitive market. Wow, I'm even sounding like a marketer! Hosted business VoIP services have had a great appeal on the legal industry for a variety of reasons. Many of the features apply well to an attorney's office, and the flexibility inherent with hosted services provides an inexpensive avenue for growth and expansion. System Features - Many law firms, especially in the small to mid-sized practice range, acknowledged that the system features were an upgrade from their previous system. Referenced often were the auto attendant, voicemail to email, one-touch call recording, and three way conference calling. Items like the call detail records simplified record keeping, as they could map them into a billing record. Creating speed dial lists allowed for quick transfers to cell phones or commonly called numbers is also seen as beneficial. Customization - Although most law practices have a level of common requirements, there is still a high degree of customization of the service to how they conduct business. This benefit resonates across industries, but was referenced often by this set of customers as being important. Hosted VoIP services provide for a great degree of customization, as it is simply a program, assuming the provider has a platform that is flexible and adaptable. We take great pride in handling all of this for our customers as a part of our service, and never charge for changes or adjustments. Economically Beneficial - As mentioned in several articles written before, the initial investment for hosted VoIP services is much lower than an on-site system. Perhaps more important is that, when a firm is growing, they don't have to worry about out-growing a system or spending money on reprogramming a current system. With hosted VoIP, you can add or remove users from the billing structure with ease. If there are other system impacts of adding an employee, such as call flow or auto attendant, these changes can be handled without cost. Thus, as practices add resources, they do not need to migrate or spend a lot of money to add the additional phone to the service. Phone Support - One of the great benefits with the hosted VoIP service provided by sipVine, is that we take on the role of the phone department for our clients. Within law firms, they may not have an on-staff IT professional, or, if they do, they may not have the capacity to address phone administration as well. Many of our customers in this arena have expressed appreciation for getting their phone service and phone administration from the same company, as it has become one less item for them to worry about. If you are a business from any industry, and in particular the legal services industry, you can enjoy these and many more benefits by switching to Hosted VoIP services. Investigate your options, as there are many providers out there. We would be happy to entertain a conversation to see how such a service could enhance your current communication practices. · On Demand Call Recording – With a simple two touch sequence on their sipVine phones, these firms can record their conversation with an external party. These recordings are indexed and delivered via email with a wave file for easy electronic storage. · Meet-me Conferencing – sipVine provides a conferencing service that provides for up to ten external parties to participate. Of course, three way conferencing is also available on demand directly from the sipVine phones. · Call Detail Records – Several clients receive monthly distributions of their call detail records for easy upload into their billing systems. · Unified Messaging – With voicemails and faxes being delivered to email, they can receive remote notification of the message to their wireless smart phones as well as upload the files to their client management systems. · Automated Attendant and Virtual Staffing Support– Many of these firms deploy sipVine’s automated attendant, which can be customized to how they prefer to route their clients’ incoming phone calls. Additionally, many deploy remote staffing options, whether it is a home office or branch offices. A hosted phone system provides the appearance that all of the staff is under the same roof. The technology deployed in sipVine’s Hosted Phone Solution delivers high quality voice calls and disaster recovery advantages. sipVine also provides all of the telecom system administration as a part of the monthly service fee. All of this functionality and more great features are delivered in a reliable and purposeful solution that allows for the easy addition of users as the firm grows. Whether you are a professional service firm or a general business, sipVine’s Hosted Digital Phone Service can be customized to how you do business. Contact us today to learn how!